Club Penguin Cheats by Mimo777 Club Penguin Cheats by Mimo777: Club Penguin Adds More Stickers! I'm still thinking these are stamps/stickers you can get for playing games? If you notice the middle one is the same as on the Club Penguin Advertisement that said "July 26. It all starts." So, we should find out in 10 more days! Woot! Let me know if you have any other theories as to what these stickers are, k? To find out more details about these items, click here. Well i think its a good idea that they are game stickers mimo. although the rockhopper one likes like it may be rockhopper exclusive, if they they ARE from games. or they might be found near games right? Yeah, they're probably game stickers! I think I know what "it all starts" means. On July the 22Nd (I think) The game stamps start! Maybe if u play the game and get a pretty good score you get a stamp/sticker. Maybe if u play a game and get a stamp you don't have to pay $10 to send a postcard and just use the stamp that you got from the game..
OMG! I think i know what there for!! I agree with you that they are for games, and when you get a high score then they give the stamp to you. Once you get the stamp i think that you might be able to put it where your REAL pin goes, like the flag and other pins! on your player card you would have the pins!! Also i think that there might be a new game including Kutlzy and Herbert, beacause there IS a game on rockhoppers SHIP, and the one with the surf board reminds me of the games "Caching Wsves" and the one with the disco ball reminds me of the dance off game! i think they might be activity stickers. like, when you complete a activity they give you the sticker for the activity you completed. example: if you meet rockhopper or get a high score in surfing game you get a sticker. i think all you half to do is play the game and get a really good score and the rockhopper one i think you half to dig it in treasre hunt the 2 player game and i think you put them on the top right corner of your player card.But where will they go in your player card? I think the Crab (is that Klutzy?) on the first sticker/stamp is for Aqua grabber. Then the dancing sticker/stamp is for Dance Contest, and the surfing one is for Catchin' Waves. I agree, but the rockhopper one is kind of odd, dont you agree? Thats why mimo's web is the best! The cheats are always instantly here! I think the middle one represents the things on the 26! I like the Klutzy.... Klutzy is my favorite crab in the whole world! I want that sticker! Thats what i thought at first too, but Club Penguin has already said that they have nothing to do with penguin mail. They said that the stamps/stickers go on your player card. Great theory though, keep guessing! mimo i told u about the klutzy thing before anyone and i wasnt thanked for it.plz can u give me credit cause i have never gotten credit for anything. this is wut i said that the frist one was from aqua grabber cause the crab was stealing coins! Hi Mimo,nice posts,your blog is awesome. One question:When CPIP is going to open again? ~~~~~~~~~~~~~~~~~~~~~~~~~~~~~~~~~~~im thinking game achievements when you do something rockhopper could be what do you call t oh ... tresure hunt! ~~~~~~~~~~~~~~~~~~~~~~~~~~~~~~~~~~~ya or tresure hunt wait do we get it ato matic if we alredy met him??? ~~~~~~~~~~~~~~~~~~~~~~~~~~~~~~~~~~~or collectables that would be cool thaough like mabey we could use our stamps over and over and make a custom postcard! maby this means that there will be a new room if u collect them all!! Maybe! I was wondering, what game has to do with Rockhopper? Maybe Treasure Hunt? You might have to find them in games, instead of achieving something! i think these are for games too. The one with Klutzy the crab is from the Aqua Grabber game, the one with the penguin dancing is from the Dance Contest game, the one with the penguin surfing is from the Catchin' Waves game, and the one with Rockhopper is from the the Hydro Hopper game. Maybe! At least there's no Penguin Band one or Aunt Arctic. I can never find them! Yea! Maybe we can put them on postcards! I'm positive they are SOME kind of stamps, but I have no idea about what they do! I think it's either Treasure Hunt or you have to find him! It's probably Treasure Hunt, though. Maybe you have to dig it up! I think the middle one is Catchin' Waves... But it could be anything! I don't really understand what you're saying, though. LOL! Yea! That's what I think! Awesome theory! Maybe we have to find some of them too! Like pins, except in games! You have got to be REALLY fast to get credit! I was commenting with something, and when I came back to CPG, Mimo had posted it! If he doesn't give you credit, chances are he found it already! Just keep trying! I'm thinking that they might go in the Pins or Awards section. I'm thinking that you get the Rockhopper one if you meet him. Hmm, maybe. I guess we will just have to wait and see! Or maybe we will get a free item if we collect them all? I think we get them as a reward in games and we use them as pins. I guess we will have to wait and see! So kind of like 101 days of fun! -----------------------------------i think it is the crab from aqua grabber but i agree KLUTZY IS AWSOME! hey Mimo777 its me Jordon James I love your blog its awsome and cool. Like lightning, faster then light! its been like a trillion months, when will the caption contest winners be announced?! I think they have to do with games from CP, and the RH one might be for Treasure Hunt! And probably for playing games and all that! Awesome theory, it's probably right! That's a GREAT theory, meeting Rh, completeing missions, going to parties, it's awesome, and you know it! I think yours it right! Hmm... I was wondering how they could be for games because Klutsy and Rockhopper aren't in any games. But the others look like games. But, the stickers could also be for parties, right? Like if you go to a certain party you will get a sticker! 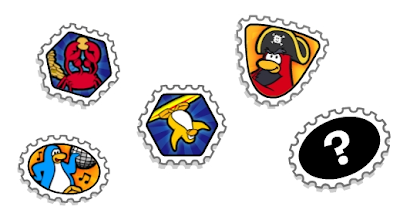 When Rockhopper comes, you collect his sticker! For puffle parties, you collect a sticker! Do you get it? It's only a theory though. You rock mimo! thats what mimo said! great minds think alike! mimo well I saw that surfing one in the newspaper I have no idea what it means but I will soon find out and tell u! Yes, the Rockhopper one is probably from the game "Treasure Hunt," which can be found in the shiphold when Rockhopper is on the island. So, they still could be all game stickers. What is "CPIP"... I'm like a CP expert, but I can't figure out what CPIP stands for... it seems framiliar! 1. Play Cart Surfer and get a score of 2500 or more. 3. Send a postcard to your best buddy. Good idea! It kind of throws you off track with just pictures, dont ya think? Is there already a crab in Aqua Grabber? I never saw one... IF there is. the second one... either DJ3K or the Dancing contest one. the fourth one... maybe the treasure hunt game, the one on rockhopper's ship?? that would be shweet!!!! im still hooked on my gameroom- the one that has a door for each game on club penguin, or at least close to that, and if you play them all you get a prize or something... idk it would be fun :P i guess it would get kinda boring tho after a while, so it mite have to be a new room during a party or sumthing! that would be really cool! good idea! You do argue a valid point... I think it may be possible! Or, of course, there is the possibility that they are completely unrelated to club penguin online but simply an item available for purchase or for use in the US. Both points make sense. Uh, I think it might be stamps for your postcard. sorry i haven't been modding! i'll do some now. when the stickers come out, i'm gonna collect some of them! yay! yeah! i bet! they should make some for puffles. most of them have their own game anyway. Hey Mimo! Do you want to meet me tomorrow at 12.00 on Big Foot? We'll meet my iggy it'll be on the map! My penguin name Finders1. Please reply and see if you can meet me and become buddies!! I think you have to find hiddon places in diferent games. Then at the end they give you a stamp (with your coins). yea cool but what about new feild op? I bet that the water party will come! WOW even MORE stickers!How many mor will there be? I don't think they are for games cause it says ther are a LOT of them Don't know what they could be for though.. I think these are collectibles when you visit an event. Like Rock hopper. And the music one might be for the Music Jam. also make this available only to people that own the original EPF DS game. So soon, we will be able to see the old EPF command room in the VR room! Probably hundreds for CP, there known to do BIG things! That's a cool way to think of it Muddy, I would love doing that! And I made a list to! 1. Round up some puffles at the Pet Shop! 2. Rock out at the Lighthouse. 3. Check some fish and go Ice Fishing! Awesome idea for the fourth one! I would love that type! I am SO sorry that I have been gone for SO long now. Well I am now back and ready to mod! So lets start at the begining shall we. There is pretty much only one problem with your theory. You can't get high scores in Club Penguin, and even if there were a few million people play CP, and at least ONE of those many people has either be EXTREMELY good and better than everyone else or a hacker. Not everyone plays by the rules and some people play CP a LOT and are VERY VERY VERY good. Sorry but just like I told ilovemusic, there isnt high scores and if there were they would be nearly impossible too beat. Maybe in order to get the stamp they will say something like "You must get at least 100 points to get your stamp". So kind of what you are saying. Sorry but CP already said that they have nothing to do with CP mail. Just a collection. Mimo probably just found it before you. I think Mimo checks CP before he checks his comments so he may have been on CP and saw the stamp and guessed it, checked his comments and noticed that you knew it as well but he already found it. No one knows if CPIP will ever open again. A few people have already guessed this but there are no high scores in CP. If there were, they would be SUPER hard too beat because you are competeing against a few million people. Who says it's klutzy? There are crabs in ice fishing. CPIP is Club Penguin Improvment Project. Look it up on Google. Unfortunately it's closed now. CP has already said that they have nothing to do with CP mail. But in RH's ship you can play a game. Sorry but first off Mimo doesn't reply to comments. Too my knowledge he has only commented once and that was for decoding Mimo. Second Mimo doesn't meet anyone on CP unless they are a Mimo mod or higher because he is so famous that he would always be meeting someone every seond of the day.